What does strategic planning mean for a national and a regional level? What are the different steps in strategic planning? And how do we set up a proper strategic planning process? These and other questions are essential to be answered in order to establish a sustainable Scout strategy. 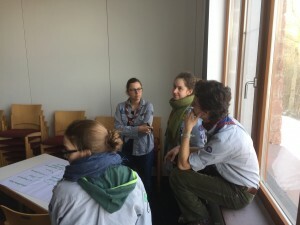 The German „Verband christlicher Pfadfinderinnen und Pfadfinder VCP“ is among those being in the middle of this kind of strategic planning process. And there are some successes already, but at the same time there is much work left to be done. Strategic planning is nothing that happens behind closed doors in the national board. It is essential to go with a participatory approach on all levels. For VCP that means to include regional leaders in the relevant discussions. WOSM has been asked to contribute with a one-day-workshop. The past weekend, 15 leaders from all around Germany developed a deeper understanding of what strategy means for VCP and why strategic priorities are essential to focus and to make a sustainable change in an organisation. The beautiful surroundings of the Rieneck castle helped indeed to be inspired and to understand, why strategy and strategic planning are very useful.